If you can't make it to REI tonight, pick up Best Hikes With Dogs: Texas Hill Country and Coast, by local author, journalist and native Texan, Melissa Gaskill, pictured (below left) with her dog. Gaskill has spent more than 20 years hiking and camping with her dogs all over the Lonestar State. In this new guidebook, she shares her favorite hikes in the Hill Country and Coast areas that are sure to delight both you and your pet. The hikes range from short jaunts to longer, challenging trails. Discover everything from rugged hills with limestone cliffs and rolling terrain, to wide-open areas with brush and cactus, to the coastal plain with its grasslands and pine forests. 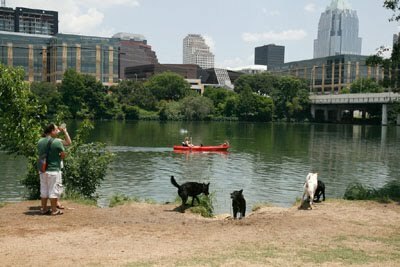 "Best Hikes with Dogs: Texas Hill Country and Gulf Coast is a great resource for dog owners and dog lovers who like to get their canine buddies out on the trails with them… Trail descriptions are excellent, with the trail(s) laid out carefully on a topo map overlay with trailheads, picnic tables, parking areas and campgrounds, if any, marked on the maps."